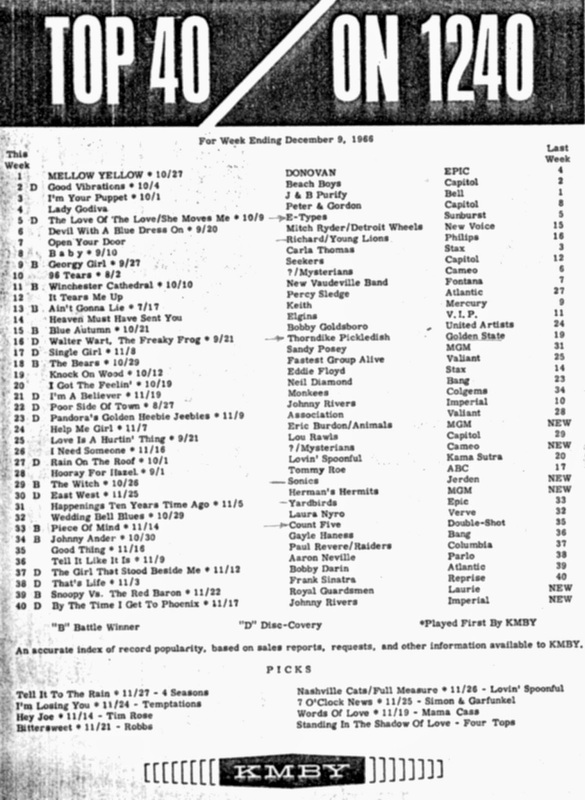 The Righteous Brothers top this WPAG Chart from this week in 1965 in Ann Arbor, Michigan. 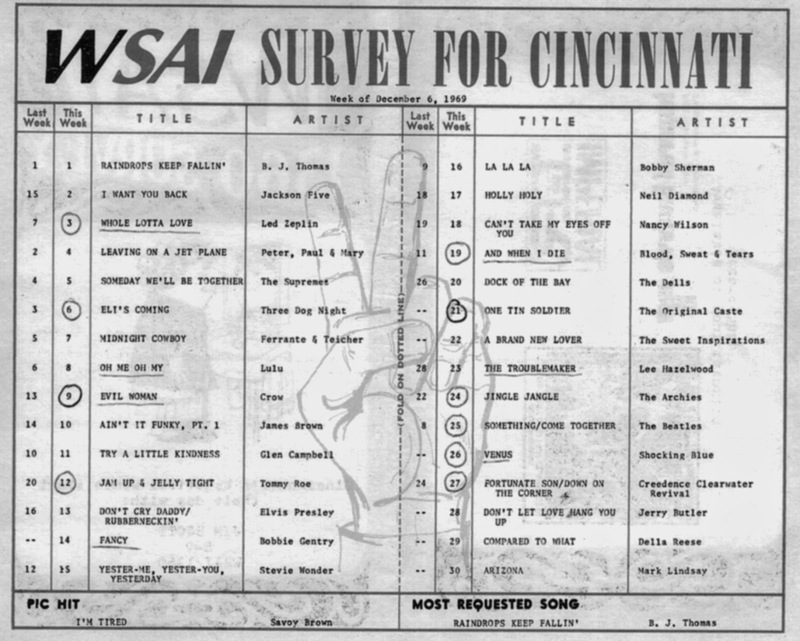 A couple of other songs that are performing quite well here include "Sunday And Me" by Jay and the Americans (one of the first chart hits written by Neil Diamond), "Man In The Glass" by The Underdogs, a local band out of Grosse Point, Michigan and "Princess In Rags" by Gene Pitney. Jumping ahead to 1969, we find one of my Forgotten Hits Favorites ... and one of those songs "you didn't even know you forgot" ... "Fancy" by Bobbie Gentry. (So much attention was paid to her revolutionary track "Ode To Billie Joe" that most folks have forgotten that Bobbie hit The Top 40 two years later with this one. Kind of surprising to see Nancy Wilson charting with "Can't Take My Eyes Off You" ... or The Dells with their version of "Dock Of The Bay". We also find The Original Caste version of "One Tin Solider" debuting at #21 this week ... two years BEFORE Coven would run their version up the chart! 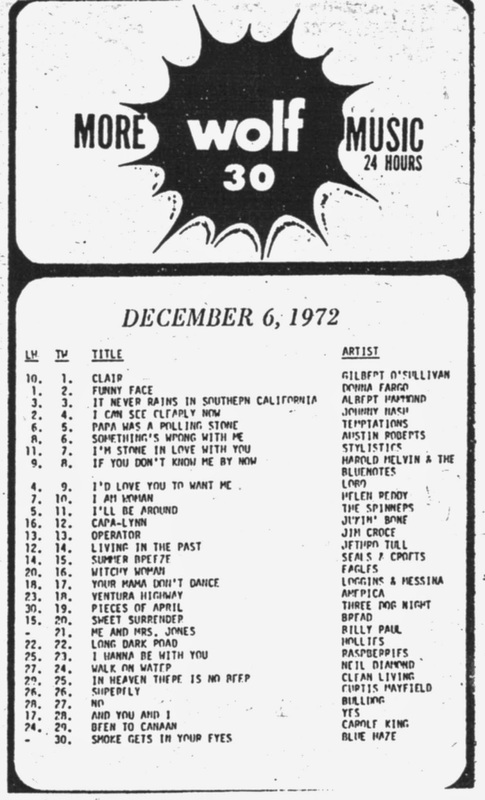 Referring to this 1972 chart from WOLF, you'd have a pretty tough time convincing anybody that there was much good music on the radio during this era. "Clair" by Gilbert O'Sullivan tops the chart, followed by the God-Awful "Funny Face" by Donna Fargo. You'll also find "I Am Woman" by Helen Reddy, "Pieces Of April" by Three Dog Night and "In Heaven There Is No Beer" by Clean Living as you scale your way down the chart. However, there ARE a few tracks here worth listening to. The Austin Roberts song at #6 is a goodie that still deserves a spin now and then ... as does Bread's #20 Hit and The Hollies' "Long Cool Woman" follow up hit, "Long Dark Road". I'm also VERY fond of the Bulldog track at #27. This band features former Rascals members Gene Cornish and Dino Danelli and was one of my favorites at the time. (Here in Chicago it only received airplay on WCFL, where it went to #17. A two-sided hit by The E-Types ("The Love Of The Love" / "She Moves Me"), "Heaven Must Have Sent You" by The Elgins, "The Bears" by the Fastest Group Alive and "Johnny Ander" by Gayle Haness. You'll also find a couple of VERY familiar songs listed here ... but not by the artists you best know them by! Check out the Laura Nyro original version of "Wedding Bell Blues" at #32! And the Johnny Rivers version of "By The Time I Get To Phoenix", charting a full year before Glen Campbell's classic version! Lorne Greene's spoken word hit "Ringo" moves into the #1 spot on this week's Billboard Hot 100 Pop Singles Chart, dethroning The Shangri-Las and "Leader Of The Pack", which falls to #3. In between them sits "Mr. Lonely" by Bobby Vinton. British acts in The Top Ten include The Zombies ("She's Not There", #4), The Rolling Stones ("Time Is On My Side", #6) and The Kinks ("You Really Got Me", #7). Herman's Hermits climb to #15 with "I'm Into Something Good", followed by "Sha La La" by Manfred Mann at #19 and a brand new Beatles record, "I Feel Fine", which debuts at #22 this first week of December, 1964. The Honeycombs continue their fall down the charts ... they now sit at #28 with "Have I The Right". The Dave Clark Five are up fifteen places to #31 with their latest, "Any Way You Want It" ... and Julie Rogers cracks The Top 40 for the first time with "The Wedding" (#37), while Chad and Jeremy sit at #44 with "Willow Weep For Me", up eleven places this week from #55. The Zombies take over the top spot here in Chicago with "She's Not There" this week on the WLS Silver Dollar Survey. Herman's Hermits fall to #4 with "I'm Into Something Good", one spot ahead of "You Really Got Me" by The Kinks. The Overlanders crack The Top Ten this week with "Don't It Make You Feel Good" at #7 ... not bad considering that this record never even made the Billboard Chart Hot 100 Pop Singles Chart! "Time Is On My Side" by The Rolling Stones sits just outside The Top Ten at #11, followed by "I Feel Fine" / "She's A Woman" by The Beatles (#18), "Any Way You Want It" (#23) for The Dave Clark Five, "As Tears Go By" (#24) by Marianne Faithful, "The Wedding" (#28) by Julie Rogers and "Sha La La" by Manfred Mann at #30. The Lettermen are appearing at Proctor's Theatre in Schenectady in the Golden Oldies Spectacular on April 11, 2015. Also appearing are Darlene Love, Jay Siegel's Tokens, The Duprees and The Marcels. Best wishes entering your "Sweet Sixteenth" year. The Lettermen supplied the harmonies to balance all the 'Pushing the envelope' groups and artists as the decade of the sixties fathered the more experimental music of the seventies. We Baby Boomers were also emerging from our cocoons and finding ourselves as we went out and made our way in the world. They were the link to the milder harmonies of our parents and stabilized the music scene. I still have to pinch myself when I look back and realize how fortunate we were to have lived and developed in that era. Wishing you and all your FH subscribers and followers the Merriest of Christmases and a Hearty Healthy New Year (jeez when did it get to be 2015?!!!) and happy Holidays to all those who wish to celebrate the Holiday Season in their own way. Special regards to all my Oldies Music / Music Oldies Buddies who make up large group of your followers. I stay tuned to Forgotten Hits because I never know when something will pop up that I fully relate to. Love The Lettermen! The Lady In Red - The Way You Look Tonight medley is not only great sounding but extremely clever. What a great idea! >> I really like the "The Way You Look Tonight / Lady In Red" Medley ... VERY nice ... and I've gotta say you guys STILL sound fantastic!!! Thanks, Gary! (kk) Wow - this is very, very nice! Super job on melding these songs. Most of the feedback we have gotten from the promo people and others prefer "Just One More Chance", which will be the single. They say it's current with a touch of retro. To me, I think this song has the same desperation feel to it that "Hurt So Bad" has. If given JUST A CHANCE I know it can be a hit. "The Way You Look Tonight / Lady In Red" came in a close second. Thanks to Gary Pike for sharing his insight into little-known but key details in the Lettermen story. But, then again, us Garys have to stick up for each other. During my tenure as the Music & Entertainment Editor of Reader's Digest we compiled and released a three-CD box set entitled "The Lettermen: Their Greatest Hits and Finest Performances" (Reader's Digest Music 092C). That 1994 set was assembled from all Capitol masters by Eric Berman and came with a 32 page booklet of extensive track-by-track liner notes. 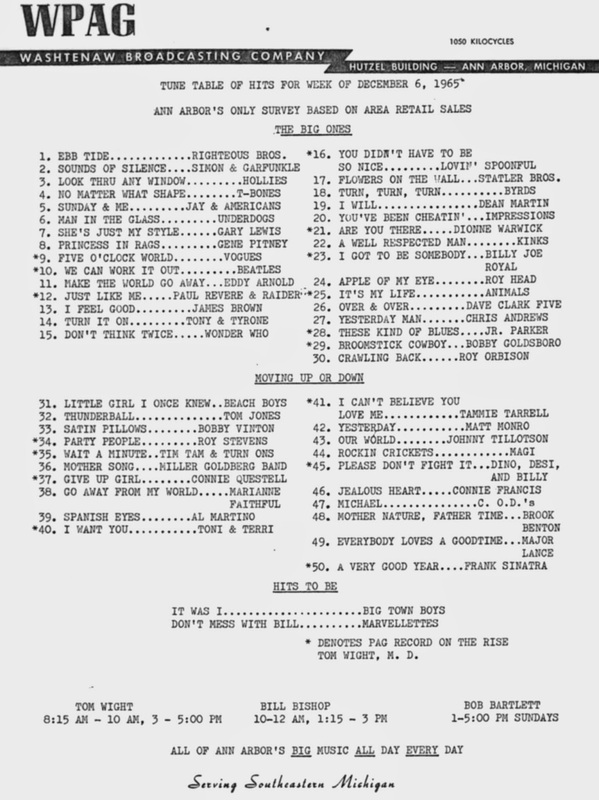 Typical of Reader's Digest collections, it included every single tune the group placed on Billboard's Hot 100 plus an array of B sides and album cuts ... and was sold through direct mail only. It's out of print now, but pops up from time to time on amazon and half.com. I've also licensed quite a few individual Lettermen tracks for many compilation box sets. As such, The Lettermen turned up in a lot of Reader's Digest various artists collections, including Christmas box sets. In fact, my second Reader's Digest Music release, 1982's "Christmas Through The Years," included The Lettermen's 1966 version of "O Holy Night" and went on to sell more than eight million copies. Hopefully the original Lettermen earned some decent royalties off that. My most recent use of Lettermen material was last year in the ten hour radio countdown "The 100 Greatest Christmas Hits of All Time," which Wink Martindale hosts and Envision Networks syndicates worldwide. "O Holy Night" pops up in Hour 7 while "What Child Is This" (featuring an interview with founding member Tony Butala) turns up in Hour 5. Both tracks come from their 1966 Christmas album. "The Lettermen got started in 1960," says Tony in the interview. "We were three lead singers of our own vocal groups individually and when those groups broke up we felt it would be a different approach to have each person be strong enough as a soloist to change the melody from one person to another -- which turned out to be quite a bit ahead of it’s time." First pressings of the Capitol Collectors Series cd on the Lettermen DID include the bio that had been written ... however, I've only ever seen one copy and I don't own it! They're VERY rare. That Capitol Collectors Series cd was done very well, but, as Gary also mentioned, they digitally cleaned up the audio and the use of noise reduction was definitely a bit heavy handed at times. Ron Furmanek did the remixes from the original session tapes for that cd and the mixes sound excellent, while the noise reduction was only added to the tracks after Ron mixed them and I guess he didn't get to have a say in the mastering (which was done by Bob Norberg, who is also listed as a remixer on the cd). I just wish they could've split it into two volumes to allow for more non-lp singles to get remixed into stereo. As for the folk recordings the group made, on both their albums and singles, their 8th single for Capitol was Allentown Jail b/w Two Brothers and it's a great folk record where (as best as I can determine) neither made it onto an album. Allentown Jail made it to #123 on Billboard but it was a big hit in Miami, Florida, as well as Vancouver, British Columbia in mid June 1963. The 12 string guitar player on Allentown Jail is none other than Glen Campbell, according to one of the comments on my youtube video of the song. 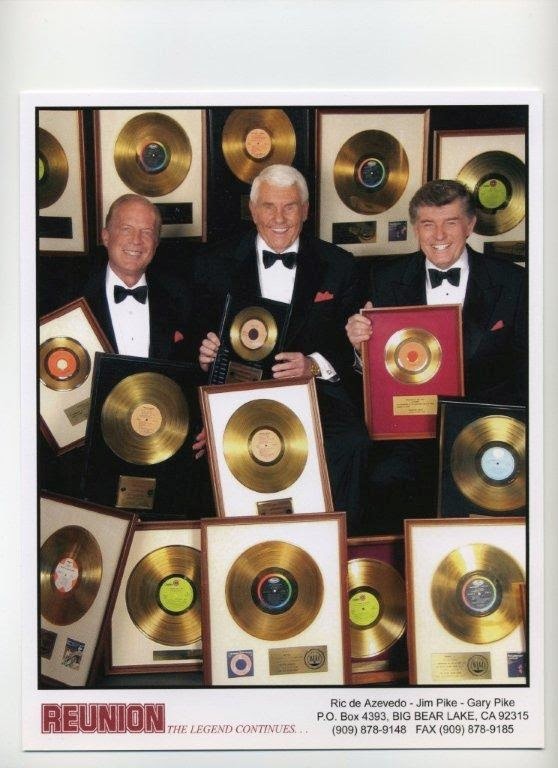 Count me among those who would like to see more Lettermen recordings on cd ... I'd really love to see it happen and maybe be a part of any releases that might come out. Lastly, I'm sending you a copy of Love Letters by the Lettermen, my favorite version of the song, which is here in stereo from a various artists LP that I found the song on before I got the original Lettermen LP the song appeared on. I'm afraid of what the lp master in Capitol's vault might sound like these days. Some might argue that the basic history of The Lettermen is pretty well documented ... at least amongst their true, die-hard fans ... but the "general public at large" may not have been privy to some of these details ... and since Tony Butala has gone out of his way to rewrite a good portion of that history now that he has sole ownership of the name, we figured we'd pass along a few more Lettermen stories that Gary Pike has decided to share exclusively with our readers. For even MORE "fly-on-the-wall" details, you may want to pick up a copy of Jim Pike's biography "My Lettermen Years: The Journey To Hell And Back". Here is a little sidebar of information involving Connie Stevens. Before the Lettermen, Tony sang with another group called “the Fourmosts”. In this group was a young girl named Concietta Ingolia. She landed a part in a new TV series called “Hawaiian Eye”, changed her name to Connie Stevens and left the group. Anyway, in her bio she mentions the story of singing in the Fourmosts and then getting the big part in the TV show, stating that after she left, the three guys continued on as The Lettermen. It makes good press but is not 100% accurate. Tony of the Lettermen is the only one she used to sing with. She later did write liner notes on one of the Lettermen albums but didn’t tell this story. Karl Engemann, Bobby’s older brother, was a producer at the newly formed Warner Bros. Records when he signed Jim Pike to a record contract. Karl knew Jim through Bobby and liked his voice. The record was not successful and later, after the Lettermen was formed, Jim brought a demo of “Their Hearts Were Full of Spring” to Karl and WB released it with no success. Karl then got a job at Capitol as VP of A&R. Jim and Bob didn’t like what WB wanted them to record and asked Karl if he could get them out that contract. Karl did and then made an appointment for the guys to see a new A&R producer at Capitol by the name of Nick Venet. Nick flipped out, signed the guys and wanted to record something right away ... but the only studio time he could get was at the tail end of a Four Prep session ... so he brought the group in and they recorded “That’s My Desire” and “The Way You Look Tonight”. A disc jockey In Buffalo, NY, one night flipped the record over and started playing The Way You Look Tonight and the phone started lighting up and he started getting requests. He got excited and called the Tower. (Capitol) They said to keep playing That’s My Desire but he said you have a hit here and I can’t stop playing it. It made their play list and started to chart. Now, WABC in New York City shared a listening audience with this Buffalo station but WABC was the top, top 40 station in that region and this station in Buffalo (and I can’t remember the call letters for the life of me) forced WABC to start playing The Way You Look Tonight. NOW, Capitol took notice and flipped the record. It spread from the East Coast to the West Coast. I honestly think if the record had peaked all over the country at the same time it would have charted higher than 12 or 13 in Billboard, but hits that spread from one coast to the other just don’t chart nationally as high as they could. The Way You Look Tonight reached # 2 here in LA on both top 40 stations. There were numerous other markets where it was in the top 5 but not at the same time. I remember Bob Eubanks having battle of the bands on KRLA and playing The Way You Look Tonight by the Lettermen and The Way You Look Tonight by, I think, the Jarmels. The Lettermen won handily by call in votes. The flip side of the Jarmels version was titled “A Little Bit of Soap”. That side ended up being a bit of a hit for them. Some time ago you mentioned in Forgotten Hits about Jay Siegel of the Tokens possibly replacing one of The Lettermen in the early eighties and that’s accurate. After my brother Jim Pike sold controlling interest in the Lettermen name to Tony Butala (legally, Tony was the only one Jim could sell to), Tony had complete control of the group and offered Jay the job to replace me because I was leaving. I wondered why it never happened. Jay came to see a show and we talked, but I guess it never worked out. I was leaving (in part because of the heavy tour schedule and up until that time my family traveled with me ... and I had a wife and three kids.) Fortunately The Lettermen were enough in demand that William Morris could block book us so we toured much like most of the country artists. We all traveled in motor homes with a semi for the equipment and sound guys and a Greyhound for the musicians. We were 100% self contained. But now my oldest had started school and the family stayed home. I guess the heavy tour schedule was Jay’s reason for not taking the job. After I left, I heard Jay was going to produce a couple of songs for a new Lettermen single but I never heard anything more. Anyway, Ralph Nichols took my place. He had been a replacement in the Sandpipers earlier on. Nice guy ! He lasted a couple of years and got tired of the road, or the pay, or the lack thereof. Through the years Tony has had about 17 different guys as Lettermen. Back in '03 I think it was, Tony asked me to fill in for (at that time) Letterman Darren Dowler for a couple of months so he could rest his voice. I was singing with The Reunion at the time and fortunately both our schedules did not conflict so I took the job, much to the shagrin of my brother Jim, but he understood. During this time Tony told me that Darren and Donovan’s (The other two Lettermen) contracts were up that year and wanted to know if I was interested in coming back. I knew he was just using me as leverage in his negotiations with Darren & Donovan so I turned him down ... besides I was involved with The Reunion as well as filling in with The Four Preps . I guess you could say that Jim and I at that time were quite involved not in musical chairs but musical groups, no pun intended ... Jim with the Four Preps and Reunion and me involved with The Lettermen, Preps and Reunion. The four Preps at that time consisted of Bruce Belland and Ed Cobb of the original Preps, David Somerville of the Diamonds and Jim Pike and me of the Lettermen, and we sang all the hits of these groups, and I got to sing all those great hits of all these great groups. Darren Dowler, of course, went on as lead singer with Paul Revere and the Raiders and also with Bill Medley, filling Bobby Hatfield’s role. Things have settled down a bit now and I continue with my brother Jim in Reunion, singing all the old Lettermen hits, and then some. Good response to Part One of our Lettermen feature yesterday ... and lots of folks entered our latest Forgotten Hits Give-Away to win a copy of Jim Pike's biography along with a CD featuring The Lettermen's All-Time Greatest Hits. We just locked in the Lettermen Christmas show for 2015! I listened to them all the time ... they were and are right up there with Frankie Valli and the Four Seasons. Kent, thank you for all you do with this site for us Rock N Rollers. I could add to your list many more of the Lettermen songs but I will add my favorites. My all time favorite would be "Graduation Day". Some more would be "Shangri-la", "The Things We Did Last Summer", "Theme From A Summer Place" and "The Way You Look Tonight." I never went for the headbanging stuff but most females didn't at that time. We loved the romantic sounds of such artists as the Lettermen. That was an era that really split the females from the males as far as music goes. Have a good day everyone and I hope you all have a very Merry Christmas. Here's my favorite Letterman Hit. Just read the Lettermen article and everything looks real good, but I need to make a slight correction. "Going Out of My Head" was one of the last songs Bobby Engemann recorded with the Lettermen and of course it was not a hit until after he left the group ... so I got to take credit for it. Not too many people know this, but like I said, you could not have asked for better timing when ushering in a new replacement than on top of a hit record like this one! Fortunately, we had several more hits after this that I did get to sing on. In addition to the two contest winners, I’d like to send you and your wife a copy of our latest CD, even if it is a couple of years old. You guys can relax after work, put your arm around her and hold each other while you play it. That is what most of our albums are good for according to the feedback we’ve gotten for 50 years! Right around the same time, one of the founding members of the group, Bobby Engemann, passed away, making this both a timely and difficult topic. However, for one reason after another this planned series never ran in Forgotten Hits. Despite all these delays, we have stayed in contact with Gary, who (in addition to filling in a lot of the story's gaps, twists and turns over the years) also sent along a few NEW tracks that he, Jim, and new partner Ric de Azevedo (formerly of The King Family) recorded as Reunion ... and I've got to tell you, these tracks sound as fresh as EVER! Remaining founding member Tony Butala currently owns The Lettermen name, and continues to perform with two other vocalists, Donovan Tea and Bobby Poynton. (In fact, they brought their Christmas Show to The Arcada Theatre in St. Charles last year ... unfortunately, we were unable to attend ... but if you check out Ron Onesti's email above, you'll see that they guys are already booked for next holiday season!) FH List Member Darren Dowler, currently the lead singer of Paul Revere's Raiders, spent several years in The Lettermen, too! However, over the past several years new leader Tony Butala has spent a fair amount of his time rewriting the history of The Lettermen, downplaying (or, in some cases, flat out ignoring) the earlier incarnations of the group. Reunion (the vocal group who can currently claim both Jim Pike and Gary Pike as members) is, by court order, allowed to bill themselves as "formerly of The Lettermen" (gee ... that seems fair ... since the group has always had at least ONE Pike family member on board at all times ... and THREE brothers at one time or another over the years!) ... and they can still sing their hits within the context of their concert ... but they can't advertise the Lettermen name. The evolution of The Lettermen and The Lettermen name has played out like a comedy of errors over the past several years ... only, as is typically the case, it's a comedy that isn't very funny. We're using these few days in the spotlight to help correct some of the myths, errors, misconceptions and flat out lies that have perpetuated themselves over the years. After some dialog this past week by Gary Pike (who reacted to an entry submitted by History of Rock And Roll Hall Author Gary Theroux), we've been able to assemble several "back-and-forths" between Gary, myself and some of our readers that I wanted to share as part of this mini-Lettermen series. It'll give you a chance to relive some of the golden memories ... as well as an opportunity to hear some of the great, new music these guys are still creating, circa 2013 - 2014. And, we've even got another special Forgotten Hits Give-Away Offer ... two of our readers will win autographed copies of Jim Pike's new book ... along with a copy of "The Lettermen All-Time Greatest Hits" CD. >>>Regarding the Lettermen: Unfortunately, the level of their CD reissues is seriously lacking. The best was issued by EMI as part of their Capitol Collector series in 1992. Significantly, the accompanying booklet did not feature any career perspective. There were neither bio details nor any mention of the group’s history. (However at $10, it’s still a great buy!). Since then, there have been budget issues and some compilations emanating from the Philippines, where I believe that the group has the type of popularity experienced by the Ventures in Japan. Collectors Choice began reissuing the Lettermen’s LPs as 2-fers but that project ended after the first two albums appeared on CD. Strange when, as you mention, the group put 33 albums on the Billboard chart! On the bio side, I cannot recall any collector magazine featuring a career overview together with a discography. I’m not sure what ... but “there is something going on here”. I’ll take Mike’s questions one at a time and answer them the best I can. The Lettermen catalogue re-issues stopped some time ago through CEMA, which is their re-issue venue. 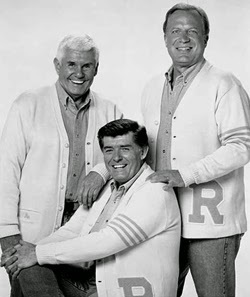 There was a 3 CD set with 36 tunes called “Best of the Lettermen, All-Time Greatest Hits”. It was released in 1993 and pops up on Ebay all the time. During our stint with Capitol we were contracted to do three albums a year. It totaled to about 45 albums not counting the re-packaged stuff and that’s quite a few songs. The year before “The Best Of”, 3 CD series, in 1992 on the Capitol label they released the “Collectors Series”, which Capitol did with all their major artists. Mike complains that there was no bio information included in the booklet and with this CD he is right, and I’ll explain why. When Capitol was putting the CD together they called each one of us and we sent them the accurate information about the group's formation and history. Everyone was happy with what Capitol put together except Tony Butala. But now here’s the back-story! You have to remember that this was 1992, long after Jim Pike had sold his rights to the Lettermen name to Tony in 1976. Through the years since then, Tony had put his spin on the formation and history of the group in the bio, so naturally he was afraid of the truth being published in this high profile release. He got so excited about this he threatened legal action against Capitol. We told Capitol, "Hey! You have the testimonies of all of us ... he doesn’t have a leg to stand on." Capitol said they just didn’t want the hassle and was going to cancel the release of the CD. We didn’t want this so Jim told Capitol to just make it very generic and just give a special thanks to all involved and add a lot more pictures and that’s what Capitol did. They only mention individual names in the booklet in a special thanks to: Jim Pike, Bob Engemann, Tony Butala, Gary Pike, etc. But, I’ll never figure how Bruce Belland of the Four Preps got his name included! The Preps had their own collectors series. We were also disappointed that my younger brother Donny, who Jim used on several of the Capitol albums and even had his picture on the last album we did for Capitol and toured with us as a Letterman, was never mentioned. We discovered this after Capitol had already pressed them up. Collectors Choice a while back did release the first two albums together that you could order out of their catalogue and I bought one on Ebay. Sad to say I was quite disappointed ... the Capitol masters have degraded so much that the tape hiss is horrible. The only CD’s that are any good are the ones released through Capitol that have been digitally cleaned up. The other masters they sell to budget sellers are just copied direct from the original tapes and are all junk. I have gone through the entire Lettermen catalogue and have digitally cleaned up all the songs. I feel like making copies and taking everything down to Capitol and saying, "Here you go, these are on me ... and please don’t send out any more junk." Mike asked why we didn’t do any Beach Boys songs ! Well, here is an interesting story. We share a mutual love of the Four Freshmen with Brian Wilson. Brian knows this and has talked about the Freshman with us. One day Jim asked Brian to write a song for us and he said he had a great idea about a Surfer Girl. This was about the same time Brian’s dad, Murray, was jumping all over Brian about sharing his talents and song ideas with other artists. The next thing you know Capitol releases “Surfer Girl” by the Beach Boys. We’ll have to ask Brian if he originally intended to give the song to us ... I don’t know. For some reason station program directors didn’t like the Lettermen doing original songs. This was reported to us by the Capitol promo men, even though we released some dynamite originals. A lot are posted on youtube. They would say, you guys should do only standards.. Mike asks about doing other groups' material and we covered a host of them. We had a real modest hit with “She Cried”, which is one of my favorites. We did an original song called “Girl With the Little Tin Heart” which was really Four Seasons-esque. Early on, there was some good folk stuff on our albums ... and you can ask Tom Diehl about that. I think we have quite a variety of songs out there. As far as repackaged Lettermen songs now days, they pop up once in while repackaged with other artists in late night Time / Life infomercials ... also the Christmas stuff. I think Capitol may be a little reluctant to release another all Lettermen Best Of or Greatest Songs because of the fiasco with the Collectors Series ... even though it’s been over ten years they might be a little gun shy, I don’t know. Also, there have already been about three best of’s, a couple greatest hits, a couple all time greatest hits, plus the budget stuff that’s been released and it doesn’t pay to beat a dead horse. I hope I’ve answered all of Mike’s questions and as far as Jim’s book not being long enough, well, he was worried it would bore people to death, that’s the way he is. Humble Jim Pike. Thanks, Kent, for the space.